SRINAGAR, Dec 5: As the cold sweeps Kashmir with subzero temperatures with Srinagar’s recording season’s low at minus 3.2 degree Celsius, people are hanging warm clothes on the “Wall of Kindness” for the poor and needy in the heart of Srinagar on the bank of river Jhelum. The idea of donating warm clothes by hanging them at different places was introduced in Turkey and followed by several other countries. On Tuesday people were surprised to see several hangers on a wall painted in black and white along the Jehlum embankment popularly known as the Bund. However, the onlookers and the netizens appreciated the effort after finding that the motive behind it is to donate the clothes among the poor and needy. Several people were seen picking up the clothes without having to move from door-to-door. The Kashmir chapter of Who is Hussian, a charitable organization inspired by Hazrat Hussain (RA), is behind the initiate. “The countries like Turkey and Iran have started the trend and we are following. The movie is to fill the social gap and inculcate the spirit of giving among the people. This is a first of its kind initiative in Kashmir. We are receiving calls from people across the Valley who wanted to start it at their respective place and that is a big success for us, “Owais Ali, a representative of the NGO that is behind the initiative, said. He said concept is based on anonymity, so that both the giver and sender remain anonymous without lessening dignity of people in need. 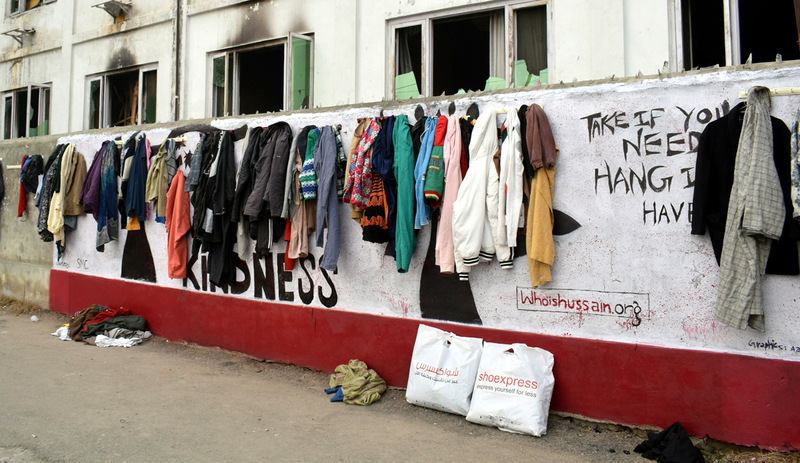 Several people donated the warm clothes by hanging them on the wall, “Who ever needs these clothes can take it from here? I saw it yesterday and came with clothes today. I appeal everyone to come here and donate clothes for poor and needy,” a girl said. During the last decade and so, people in cities and rural areas of the troubled Kashmir Valley have actively been engaged in setting up orphanages and channeling donations for the needy and trying to help fellow citizens in distress.